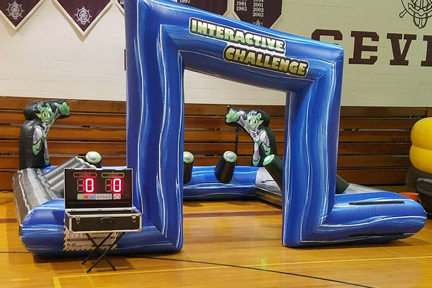 Rent an Interactive Challenge Game for your next high school after prom party, all night grad party, elementary school event, carnival, birthday party entertainment. Call Talk of the Town 301-738-9500 for booking information. Interactive Challenge - Challenge your hand-eye coordination, endurance, and competitiveness, as you compete against a friend, to see who can hit the most lit pillars, within the inflatable arena. Includes: Inflatable, blower, 10 pop up pillars with led lights and sounds, electronic scoreboard, led targets, and 1 attendant. Requires: Electricity (110-volt, 11 amps).